Adams County’s craft beverage trail launched in early 2018, so if you haven’t started your Pour Tour journey yet, winter is the perfect time to do so. Grab a passport and make your way through Adams County’s craft beverage tasting rooms, taking tasting notes and collecting stamps in your passport as you go. As always, be sure to explore the trail responsibly. Gettysburg is home to many museums, and winter is the perfect time to choose one you haven’t been to and spend the day diving into all that the museum has to offer. Have you viewed the Cyclorama at Gettysburg National Military Park Museum & Visitor Center, toured the cupola at the Seminary Ridge Museum or checked out the 3D exhibits at the Gettysburg Heritage Center? Make time this winter to discover something new. A wonderful indoor winter activity – gather your gang and get ready to be challenged at one of the Gettysburg area’s Escape Rooms. In Gettysburg, try 1863 Escape or Escape Gettysburg, or take a short drive to Hanover, Pa., for Escape Confusion. Each Escape Room has multiple rooms, so there are plenty of opportunities to try something new all winter long. This is a great wintertime activity for a group of people who enjoy food. Here’s our favorite way to do this: choose a specific dish or cuisine, gather a group of friends and hop from restaurant to restaurant, trying each restaurants’ version of that chosen dish. A couple of ideas to get you started: try this Adams County Pie Trail or comfort food dishes at Gettysburg area restaurants. No matter your winter sport of choice, you can do it all from Liberty Mountain Resort. Liberty Mountain offers both beginner and advanced trails for skiing and snowboarding, as well as a separate snow tubing area. Or, give ice skating a try – show off your skills or just try to stay upright at the outdoor ice skating rink. If relaxing in a cozy lodge is more your thing, you can do that at Liberty Mountain, too. End your day with a casual meal at Eagle & the Owl, or for something more upscale, try Ike’s Chophouse. Despite the cooler temperatures, winter is a wonderful time to get outside for a hike. The Gettysburg battlefield is a great place for walking and hiking, and is gorgeous when it snows, or check out nearby Strawberry Hill for a wooded winter hiking adventure. The winter months are a wonderful time for some self-care. The holidays are over, it’s cold outside, and it’s time to reset for the year ahead. And if you’ve gone out for some winter hiking, skiing or snowboarding, a day of relaxation will feel even better. There are many amazing spas in the Gettysburg area to choose from – try a massage, a facial or just a fresh haircut. This tour is done from the comfort of your warm car. 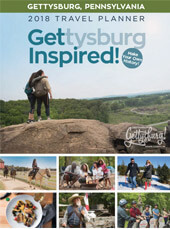 A Licensed Battlefield guide will do the driving for you, taking you around the Gettysburg battlefield and giving you an in-depth look at history. If you do happen to be touring the battlefield on a nice winter day, there can be opportunities to exit the car and step foot on the battlefield as well.